In April all children took part in the preparation of spring decoration and preparation for the Christians holidays. On April 1 we were visited by the Red Cross, who organized various Easter activities, such as painting eggs etc. 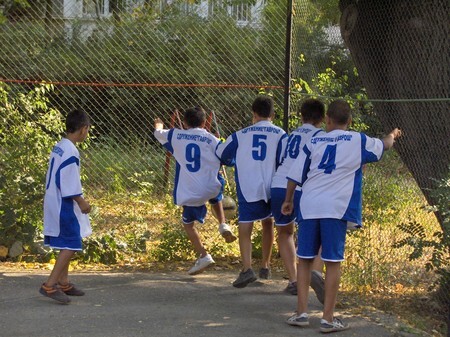 On April 16 we organized sports holiday together with the children of Gavroche and Home “Kniaginia Nadejda” Varna. After the football match played on Gavroche sports field the holiday was closed with a party and certificates conferring. In the end of February a computer system was granted as a gift from the students of „Dr. Ivan Bogorov” school. The system has been set up in the classroom and has been accepted with much joy. For March the 1st the children of Center for temporary accommodation prepared martenici together with volunteers from the Red cross. A brainstorm contest and poetry reading, both related to the holiday, were organized for the celebration of the national holiday of Bulgaria March 03. 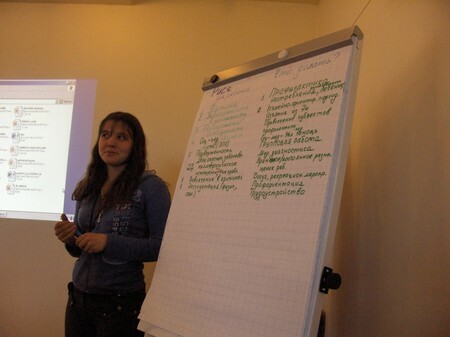 During the first quarter of 2010 Gavroche was coordinating the local implementation of the project “Palno 6” of Association Face to Face from Sofia. The project was targeted to the prevention of human trafficking. 16 peers between of age from 15 to 19 were engaged in the activities, who had been trained by Yordan Tcankovski and Bistra Slavova to conduct trainings to their coevals. More than 200 students of age 14-18 were included in the training sessions in 8 schools. In October teachers, educational counselors and nurses from a number of schools and kindergartens went trough training course led by trainers previously trained by Gavroche to work on preventing violence against children. The trainers exchanged their experiences with their colleagues, who then began to apply the group work modules with children of different ages of the respective schools. The modules were developed by Gavroche and are included in the already issued "Guidance on preventing violence against children”. Amongst these schools are VII School Naiden Gerov "PS" P.R. Slaveikov "FT" Vasil Levski "and others. Sessions are held in GHG Architecture, Construction and Geodesy, Plovdiv, and in School "Prof. Dr. Zlatarov "Parvomay. From September 7th to September 10th Gavroche hosted a delegation from St. Petersburg, Russia, consisting of 7 members and including representatives of the organization "Vrachy detyam” /”Врачи Детям”/, as well as representatives of various city and municipal structures in the social sphere of the Russian city. The delegates were engaged in dynamic program, part of which were the arranged working meetings with leading representatives of local authorities - in the face of the Vice-mayor, the Directors of the Directorate of Social Affairs and Housing Policy - Dr. Zdravko Markov, and the Directorate of “Prevention "- Mrs. Koeva, and others. 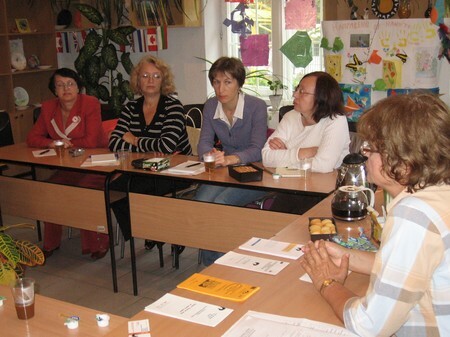 Furthermore, part of the program was a round table on 8.09.2009 with representatives of local social structures and services such as Mrs. Maria Chankova from the Regional Directorate of Social Welfare, Mrs. Dimitrichka Kuncheva and Mrs. Anna Konukova from the Directorate "Social Assistance", inspectors from children's pedagogical room, secretary of the local committee “Combating antisocial behavior of minors” - Mrs. Dabina Karlova, the Director of the Complex for social services for children and families - Mrs. Rumyana Yordanova, a representative of the Directorate for Monitoring Child Rights and others. Series of trainings were held in September for teachers from several schools in Varna on the topic “Prevention of violence against children”. Trainers were their colleagues trained at an earlier stage of the project. This year, the theme of prevention has been included in the program for the students studying in the specialty “Nurse” at the Department of Public Health at the Medical University. 40 students in the fourth year are going to go through this educational and training course. A two-day-long training course for our team and partners of the Association "Gavroche" started on 28th of August. The topic was „Quantitative and qualitative assessment of the effect of a project’s implementation”. The training was attended by representatives of different organizations such as “Chance and protection", Haskovo, Center Maria - Gorna Oryahovitsa "Demeter" - Burgas, "Tulip" - Sofia, "16 +" - Sofia. These organizations are our partners in the project "Dissemination of good practices for child protection in Bulgaria” lead by the Oak Foundation, Switzerland. The children using the services of the Association "Gavroche" enjoyed plenty of happy moments in a summer camp in June in the Stara Mountain, in particular in the picturesque region, called Elenskiya Balkan. At the National Center Gavroshovtsi were welcomed three groups kids, whose time was organized and filled with numerous activities such as walks and excursions, sports games, carnivals, fireworks. Groups of students in English colleges started their annual visits on June 20. Each summer students come to the center to have fun with the children, entertaining them with unconventional and amusing activities. Volunteers come in Gavroche with the assistance of OHAV Organization (Oxford in support of Balkans). In June at Gavroche was conducted an educational course for lectors and trainers on "Prevention of violence against children." Teachers and pedagogical advisors from 3 schools and 3 kindergartens, a specialist from the University of Medicine and two representatives of the Municipality of Varna participated in the training. Te aforementioned kindergartens were from Sofia and Pernik. Two specialists from the team of “Gavroche” conducted a training course of employees from social institutions in the Russian city of St. Petersburg. Prof. Dr. Penka Stoyanova and Gergana Encheva took part in a project of the Russian non-profit organization "Vrach detyam, the aim of which is exchange experience between Gavroche and similar institutions in the sphere of prevention of violence against children in the streets and the organization of activities in protected housing young people. On March 1st students from "Club 2000" in the Professional School of Textile and Fashion Design came in the centre and gave each child a martenica. In addition the children prepared a board for Baba Marta and showed it to the guests. As well another board was made for the Liberation Day - March 3. In March with the help of Ms. Tanya Beech sports shoes and clothing were purchased for the children from the Center for temporary accommodation. The funds for the donation were raised by Mrs. Gaby Kusters in a Christmas bazaar of articles made by the children at a school in the town of Hilden Germany. 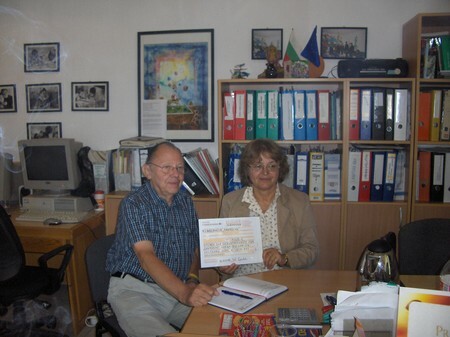 Mrs. Kusters was accompanied by Mr. Wolfgang Gube, who donated 1500 euros.